Gobble up this gorgeous holiday centerpiece! 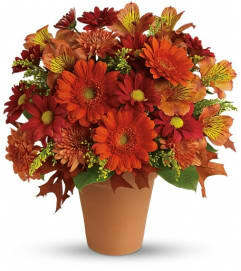 Orange roses, orange asiatic lilies and orange alstroemeria are charmed by burgundy cushion chrysanthemums, huckleberry and oak leaves. 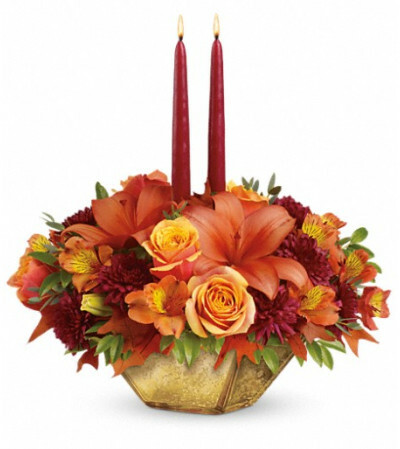 Delivered in the Harvest Gold Bowl, it will steal the show at Thanksgiving dinner! 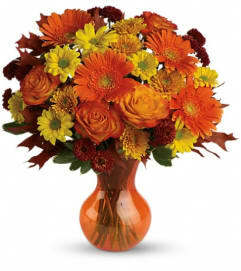 Bright orange roses, orange asiatic lilies and orange alstroemeria are accented by burgundy cushion spray chrysanthemums, parvifolia eucalyptus, huckleberry and oak leaves for a fall flair. Delivered in a gold mercury glass bowl. My sister absolutely loved the flowers! So happy that you sent this review request - because I was thinking this morning that I wish I could thank the florist! So.... THANK YOU SO MUCH! Have a wonderful Easter Season! Easy to order, great customer service, ​local business and my gift was delivered on time. My Goddaughter loved the flowers and smiley face coffee mug! Croziers Flowers is a Lovingly Florist in Vista. Buying local matters. Discover how Lovingly supports local florists. Copyrighted images herein are used with permission by Croziers Flowers.